The Galisteo Basin is an ancient seabed, site of volcanic upheaval. The fertile basin provided temporary hunting and farming grounds for wanderers, and then became the home of Pueblo peoples who survived drought, warfare, disease, and invasion for almost a thousand years before the arrival of the Spanish. Down Country is the history of five centuries of the Southern Tewa Pueblo Indian culture that rose, faltered, reasserted itself, and ultimately, perished in the Galisteo. The basin, twenty-two miles south of Santa Fe, is widely regarded as one of the richest archaeological regions of the country. 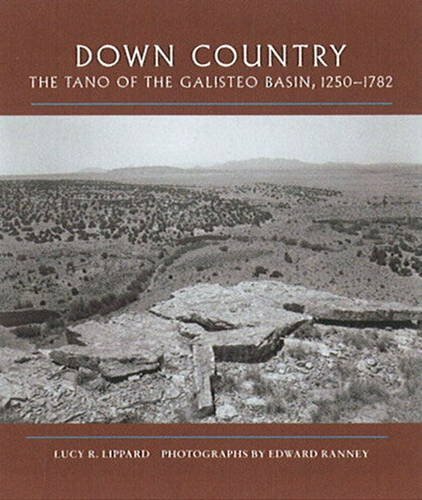 It is unknown where the Galisteo Basin’s very first permanent settlers came from, nor the exact origins of the Tano, or Southern Tewa. The Indians of the northern Rio Grande referred to the basin as the “Down Country Place,” or “Place Near the Sun.” Into this place the Tano Indians entered about 1250 AD and for three centuries made the place a center for culture and trade before they were finally expelled by the Spanish in 1782. Their story is a powerful human history that is a microcosm of New Mexico’s dramatic, complex history of pre-European settlement and post-Spanish occupation. Renowned writer and Galisteo resident Lucy R. Lippard synthesizes archaeological and historical research to create this landmark study ten years in the making, weaving together the many viewpoints of a century of study and research. Acclaimed New Mexico photographer Edward Ranney contributes a portfolio of eighty documentary images of the Galisteo Basin’s ancient sites, shrines, rock art, and striking landscape.